LTG Fahrtwind-Simulators were designed especially for use in the automotive industry. Their special advantage is the proven tangential fan technology. These fans generate a perfectly even and reproducible air flow over a wide area. The standard model achieves wind speeds of up to 83.9 mph, and special models can simulate winds of up to 124.3 mph. Test rigs and roller dynamometers are essential tools in automobile development and have many crucial advantages over actual test driving. Their main advantage is exact reproducibility of test conditions and parameters. Simulation of the airstream is essential for realistic measurements. To obtain correct results in exhaust measurements, for example, it is necessary to subject all the relevant components at the front of the vehicle and underneath it – catalytic converter, radiator, sump, exhaust system – to a uniform air flow at the specified speeds. 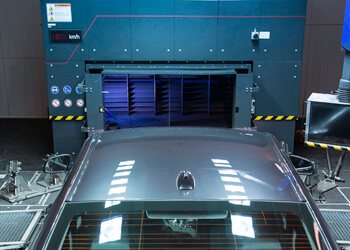 The same is true for tests in environmental simulation chambers: for example, tests of the effects of salt spray, sand, UV radiation or extreme temperatures on paint and plastic components would have little meaning without airstream Simulation. Aerodynamic and acoustic measurements are another important area of application. The components tested include door seals, outside rear view mirrors, trim strips, spoilers, etc. LTG Fahrtwind-Simulator itself must meet very stringent requirements if it is to deliver reliable results: the air flow must be perfectly even over a wide area, turbulence must not occur, and there must be no fluctuations in air speed or density. LTG implements solutions in other sectors as well, where it simulates almost all possible physical conditions. LTG Fahrtwind-Simulator were designed especially for use in the automotive industry. Their main advantage is the proven LTG tangential fan technology. These fans generate a perfectly even and reproducible air flow over a wide area. The standard model achieves wind speeds of up to 83.9 mph, and special models can simulate winds of up to 124.3 mph. We have a long list of references in the automotive industry, including many famous names. 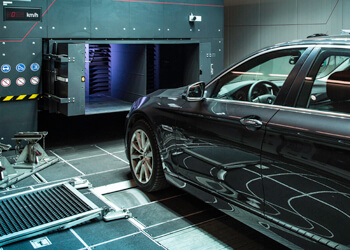 Almost all European automobile manufacturers and their suppliers rely on LTG Fahrtwind-Simulator. They are also widely used in North America and Asia. LTG Fahrtwind-Simulator are an essential part of any effective test rig.